I know this is a Blog about McLaren Vale but I strongly believe that we should look at wines and wineries outside our region – if for no other reason but to see what others are doing. This visit to the Barossa was motivated by 2 other things. Firstly, I have considered opening a cellar door on behalf of a select number of small McLaren Vale producers and I was curious how Collective Barossa was set up. Secondly, Marie (the person behind this new cellar door) and I have been conversing on Facebook and did want to meet this person. GUMPARA WINES: Established 1999. Annual production 500 cases.Vineyards : Light Pass/Stockwell. Situated: Light Pass. Gumpara Blog. KARRA YERTA WINES: Established 2006. Annual production 350 cases. Vineyards: Moppa/Kalimna/Eden Valley. Situated: Flaxman’s Valley. Karra Yerta Wines web site, blog and Facebook Fan Page. KURTZ FAMILY VINEYARDS: Established 1996. Annual production 4000 cases.Vineyards : Light Pass/Stockwell. Situated: Stockwell. Kurtz Family Vineyards Web Site. SMALLFRY WINES: Established 2005. Annual production 1200 cases.Vineyards : Eden Valley/Vine Vale. Situated: Angaston. Smallfry Wines Web Site. I highly recommend their blog and facebook fan page to find their location and to get to know these small wineries. The cellar door is inviting – when you find it. At the time of the visit there was no real signs showing where they are. As a side note another visitor during my time there was to assist in working with the council to get sign approvals. 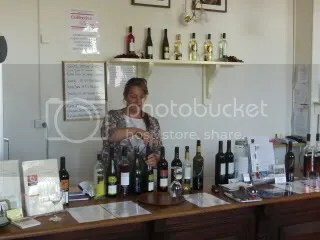 Marie, who holds the fort on most occasions is a real down to earth character and know it is her doing that not only was I there for the visit, but it has ensured that I will return on my future Barossa visits. Te cellar door is also the front of a German Museum that will provide interest to many a visitor – particularly to those with partners and kids that don’t want to taste wine. This is what Riesling is all about limes and some lemon with an uplifted perfume nose and acid that just goes on all day! Oh how I love this wine style – Eden Valley just makes some classic Riesling. Everybody should be drinking this wine to just understand how good Riesling can be. Take some of this and just eat it with lashings of fresh seafood. Can Eden Valley Riesling age I hear you ask. Don’t let me influence you – just try some of this wine and it will do all the talking. The wine has just come out of the “dumb phase” where one is not sure – to this infusion of kerosene, citrus peel, quince and again great acidity. If you are not convinced after tasting this wine then aged whites are just not your thing. The wonderful layered complexity of the wine means it would match up well with any creamy sauced chicken dishes. Hold the fort – if I was impressed with the Rieslings then this wine just blows me away! They disgorge only 20 dozen each year of this unfiltered, bottle fermented ripe red and black fruit with an aged component to it. Not a sweet wine and the tannins really combine well with the rest of the wine to leave your mouth feeling great and asking for more – and who would I be to not comply! Firstly it is good to see a wine with a little more age on it that the normal 2008’s I normally see. Secondly, a big plus on the old Shiraz Cabernet blend – so many wonderful wines were made from this blend in the 80’s only to be put on the back burner when the varietals of the 90’s came through. The nose showed a little green capsicum herbaceousness on the nose combined with lots of good blackberry style fruit. The palate is just an infusion of blackcurrents, blackberries and mulberries with the gentleness of the oak coming through. What a stunner and I am surprised at the price point for this wine. Straight away the lemongrass hits you before you can even get your nose to the glass and then red apples combined with peas adds to the intrigue. On the palate you get pears and almost honey wafts though and then a good citric acid lengthy finish. Some of the vines for this wine are 90 years old and they are dry grown. This would be one of the best Semillons I have had since I tried their 2007 Semillon last year. The wine would age gracefully but I am not sure I can leave it alone. 26 months in American oak and it shows with vanillian characteristics everywhere, but the wine is not over oaked for me. There is wonderful Mulberries and cherries here all wrapped up in the oak spiciness and I like it! Classy wine that has a number of years ahead of it – as long as you can keep your hands off it. Bring on a thick juicy Wychwood Meat rump steak – don’t worry about the side dishes, just the steak. A note on these fortifieds – they are in a beautifully shaped 500 mL and also can be purchased in a wooden boxed 3 pack. I have one of these on display near my home bar. Oh – not much else I can say. A deeply coloured blend of creamy raisins wrapped in toffee on the nose and honeyed and spiced apricots with a almost grainy tannin finish. Not a sweet finish as the spirit washes it all away. You bring this and I will bring a plate of vintage cheddar cheese and afterwards some glacied ginger (a dedication to my departed grandmother who just loved glacied ginger). This wine looks like honey and that theme follows all through the wine. You can smell and taste quince and figs to go with the honey. To round off the flavors are pear and slightly burnt caramel. Layers of yummyness here. You bring this wine and I would be there with some Woodside Cheese Goats Brie with water crackers and thinly sliced pear and nashi. A glass full of the most lovely and complex raisins, prunes and liquid fruit cake! There is a creamy mouthfeel here. This wine really needs to go with a full flavoured sweet tart or a Christmas Pudding. Nice rose coloured wine that does not disappoint. Rose petals and figs on the nore and the flavors are floral with typically Grenache red fruits. A very pleasant wine that makes me want to break open a bottle or three with some of my friends on a Sunday afternoon. Cut canes and thus raisining some of the fruit during the 2008 heat wave lead to this wine’s existence. The wine is just like drinking a slightly sweet but higher viscous white grape juice. It would match well and/or in a chocolate and orange trifle smothered with whipped cream. Wow a 2005 red as the current release. I was looking forward to this straight away. The wine did not disappoint. As the wine gets close to you nose you get a sense of the red fruits (mulberry, raspberry and the usual plums) wrapped in an envelope of white pepper. The flavors are mulberry and plums with pepper, spices and a hint of violets. This just says bring on another steak! 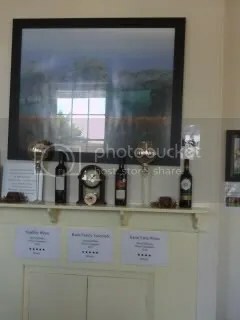 This entry was posted in wine and tagged Barossa, cellar door, Riesling, Shiraz, Small Producer, sparkling wine, wine. Bookmark the permalink.